Floating Market Discover the exotic blend of Eastern and Western culinary influences harmoniously combined into something distinctively Thai. Thai Cooking Class with a Twist: You will depart the hotel for Or-Tor-Kor Market. 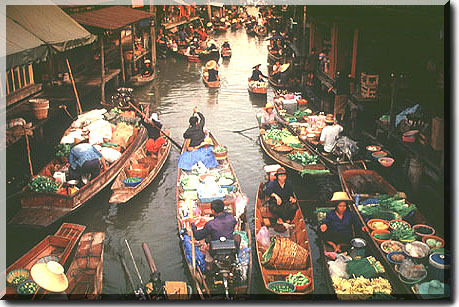 Here you will explore with a guided tour of this traditional Thai vegetable market. Upon returning to the hotel and entering the Salathip Restaurant you can relax and enjoy a fun, hands-on cooking class and a delicious Thai luncheon with desssert in souvenir apron to remind you of your very special cooking class. * Prices are per person, double occupancy for travel October 1 - 31, 2004. Prices are subject to change, availability, holiday/seasonal supplements, blackout dates and any restrictions that apply. Prices do not include international departure and immigration taxes of up to $103. Weekend surcharges apply. † Departure cities include: SFO, OAK, SJC, LAX, ONT, SNA, SEA, HNL, JFK, or EWR.